In commercial cannabis (coffee soup), CBD occurs in very low doses from 0.1 to 0.3%. The high THC levels in commercial cannabis are intended to be high and at the expense of CBD production. Nevertheless, those low percentages of CBD already have a significant impact on the medical capacities of the common cannabis and (THC) weed oil. By mixing the usual THC oil with CBD oil and then letting it grow with olive oil, different blends are possible and better customization can be provided. New possibilities! Now all oil can be made with this ideal THC / CBD ratio. I assume that this also relieves pain patients from the need to take 60 grams of weed oil in 90 days as recommended in Run from the Cure. Indeed, the type of White Widow used hardly contains CBD. Want to make oil made of recreational cannabis have some effect, you should take care of what is difficult for the patients and expensive. Endocannabinoids are used by a body as signal providers, they control all major processes. 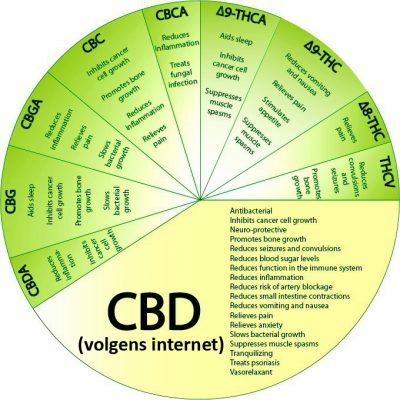 On the above disk you can see a number of vegetable cannabinoids and their action and importance to the human body. Cannabis contains only one plant more than 120 different phytocannabinoids, (phyto = vegetable). These plant substances look like two drops of water on endocannabinoids (endo = body-like), substances that make the body of every living creature. These phytocannabinoids are in the resin that covers every hemp plant as a thin layer. The resin can be dissolved in alcohol, liquid CO2 or with butane gas. When these solvents evaporate, a thick oil remains containing the phytocannabinoids. It is expected that more and more drugs will be marketed in the near future, whose action is directed towards the human endocannabinoid system. CBD related drugs will be the most common in the first instance. But in nature everything has a reason, and I can imagine that each of the more than 120 phytocannabinoids occurring has a specific effect on living creatures. So there is still a lot to discover and there are still many medicinal applications imaginable with cannabis-related medication! 1. THC raises appetite, but CBD inhibits it just as well and is therefore interesting as a slimming agent. Good news for smart businessmen who will make beautiful products with CBD to sell for a lot of money! 2. Research has shown that CBD can reduce the need for nicotine by 40%, CLICK HERE .